Welltower’s overall Brookdale concentration is expected to decrease from 7.6% to 2.9% of In-Place NOI, while improving lease coverage on the remaining Brookdale portfolio to 1.31x EBITDAR. Provides a right sized long-term relationship with Brookdale that could allow for additional future growth opportunities. Initiates a new RIDEA joint venture with Pegasus Senior Living led by industry veterans Steven Vick and Chris Hollister. Expands existing relationship with Cogir Management Corporation, bringing the best-in-class, most innovative Canadian operator to the US. TOLEDO, Ohio, June 27, 2018 /PRNewswire/ — Welltower Inc. (NYSE: WELL) today announced a comprehensive restructuring transaction with Brookdale Senior Living Inc. (“Brookdale”) which will result in: (i) a significant reduction in Welltower’s Brookdale concentration, (ii) an increase in lease coverage of the remaining triple-net assets leased to Brookdale by Welltower, (iii) an opportunity to form a new RIDEA joint venture with Pegasus Senior Living (“Pegasus”), which is founded and managed by industry veterans Steven Vick and Chris Hollister and (iv) an opportunity to expand Welltower’s existing relationship with Cogir Management Corporation (“Cogir”), a best-in-class, innovative operating partner. 37 properties will be managed by Pegasus, a newly formed management group led by industry veterans Steven Vick and Chris Hollister, the senior housing industry’s most well-respected turnaround specialists with an unmatched track record. 11 properties will be allocated amongst 6 existing Welltower operators with a combination of proven specific individual market, acuity and operating model expertise. The remaining 3 non-core properties in tertiary markets will be sold. Brookdale will pay Welltower a $58.0 million termination fee and will continue to operate these properties until they are able to be transitioned to replacement operators. Welltower will acquire Brookdale’s 20% interest in the current RIDEA joint venture for a gross value of $74.2 million, which represents a 7.20% cap rate and a per unit value of $189k. Post-closing Welltower and Brookdale will have a mechanism to further improve the quality of the remaining portfolio through an asset sale agreement. 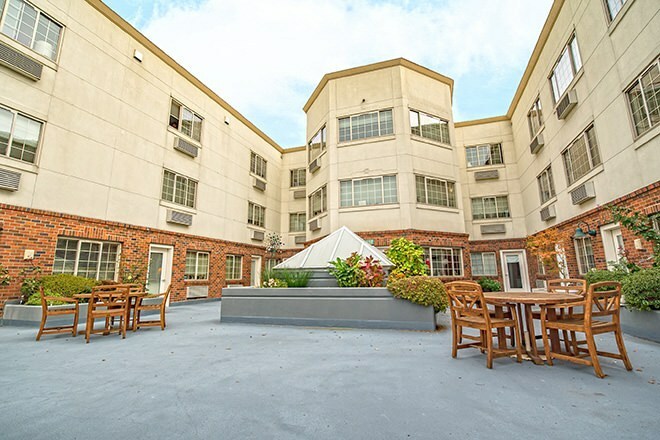 This disposition agreement will allow Brookdale to identify communities with up to $5.0 million in base rent for sale at a pre-determined 6.25% rent credit. For Welltower this will equate to up to $80.0 million in disposition proceeds at a 6.25% cap rate and improved asset quality in the remaining Brookdale lease pool. Welltower’s estimated Year 1 income loss will be approximately $5 million related to restructured leases, mainly due to operator transitions that we expect to recoup and grow by Year 3. Current occupancy of the restructured portfolio is 83.6% and provides excellent opportunity for cash flow growth. Combined, these transactions are expected to reduce Welltower’s Brookdale concentration, on a pro forma basis, from 7.6% of In-Place NOI to approximately 2.9% while also providing pro forma lease coverage of 1.31x on EBITDAR and 1.51x on EBITDARM basis. Brookdale will continue to be responsible for all CapEx and there will be no change in escalator or rent. Please see the accompanying exhibit for a reconciliation of In-Place NOI. Pro forma underwriting is based on operator provided financial information. Cogir, which is headquartered in Montreal and an existing partner of Welltower, will serve as the new operator and joint venture partner of 12 former Brookdale communities. Cogir has operated more than 50 communities achieving a 96% average occupancy over the last 15 years by leveraging the unparalleled use of technology and modern design aesthetics throughout its communities while focusing on providing high-end services for seniors in Canada. “Coming from North America’s highest market attraction ratio where 1 out of 5 seniors enjoy living in similar communities, we are enthusiastic about creating an extraordinary customer experience with our colleagues by quickly implementing next generation initiatives. With the support of Welltower’s best in class platform, we anticipate becoming an industry leading senior’s housing lifestyle provider in the US market.” said Mathieu Duguay, Cogir’s CEO. Biographical information on the principals of Pegasus and Cogir can be found below. Steven Vick: After practicing accounting as a certified public accountant, Steven Vick began his career in the senior housing industry in 1991 when he co-founded Sterling House. Throughout the 1990s Steven held key leadership roles at Sterling House, which went public in 1995 and merged with Alternative Living Services in 1997 to form Alterra Healthcare Corporation, where Vick served as COO until 2001 and then President from 2001 until 2002. In 2002, Steven Vick became the Chief Executive Officer of Assisted Living Concepts (“ALC”), a publicly traded national operator with more than 180 communities. During Steven’s tenure at ALC, the stock price increased from less than $2 per share to $18.50 when the company was sold to Extendicare at the end of Vick’s tenure. During this time, portfolio occupancy increased from 69% to 93%, and the company went from losing money to break even within 6 months of his leadership. Following these roles, Vick founded Signature Senior Living, which successfully developed and operated 17 AL/MC communities in Texas. Vick received a BA in Accounting from Wichita State University. Chris Hollister: In 1995 after almost a decade in senior living, Chris co-founded Southern Assisted Living, Inc. (“SALI”) and served as CEO from inception in 1995 until April 2006. In this eleven-year period, SALI became the largest provider of assisted living services in the state of North Carolina and one of the top twenty assisted living providers in the United States with 43 communities serving over 3,000 residents. In April 2006 SALI was sold to Brookdale Senior Living. Since 2014 Chris has served as one of two outside directors for Sunrise Senior Living, one of the largest senior living companies in the world with over 330 senior living communities in the U.S., Canada, and the U.K. Chris served on the board of ALFA (now Argentum) during the early 2000s including several years as Treasurer. He received a BS in Economics from Texas A&M University and an MBA from the Fuqua School of Business at Duke University. Mathieu Duguay: Mathieu is President, Chief Executive Officer and majority Partner of Cogir Management Corporation. Mr. Duguay has spent last 21 years in the real estate industry, mostly with Cogir. Mr. Duguay has gained vast knowledge of the various aspects of the real estate sector in the areas of management, acquisitions, development and financing. Over the years, he helped to grow assets under Cogir’s management to US$3 billion with the majority of it from the senior housing sector via a Cogir co-ownership. Mr. Duguay is known for his creativity, use of modern technology, inclusion of the highest level of modern design aesthetics and a renewed focus on client satisfaction to senior housing industry. Mr. Duguay was also Chair of the Board of Directors of RQRA, Quebec’s only association of owners and managers for seniors’ housing representing more than 130,000 residential units, a role lead by another Cogir partner today. Welltower Inc. (NYSE: WELL), an S&P 500 company headquartered in Toledo, Ohio, is driving the transformation of health care infrastructure. 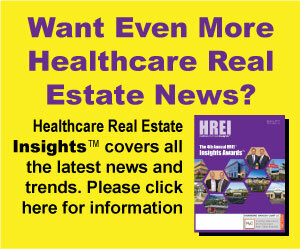 The company invests with leading seniors housing operators, post-acute providers and health systems to fund the real estate infrastructure needed to scale innovative care delivery models and improve people’s wellness and overall health care experience. Welltower®, a real estate investment trust (“REIT”), owns interests in properties concentrated in major, high-growth markets in the United States, Canada and the United Kingdom, consisting of seniors housing and post-acute communities and outpatient medical properties. More information is available at www.welltower.com. Welltower believes that revenues, net income and net income attributable to common stockholders (NICS), as defined by U.S. generally accepted accounting principles (U.S. GAAP), are the most appropriate earnings measurements. However, the company considers NOI and In-Place NOI to be useful supplemental measures of its operating performance. Welltower defines NOI as total revenues, including tenant reimbursements, less property operating expenses. Property operating expenses represent costs associated with managing, maintaining and servicing tenants for our seniors housing operating and outpatient medical properties. These expenses include, but are not limited to, property-related payroll and benefits, property management fees paid to operators, marketing, housekeeping, food service, maintenance, utilities, property taxes and insurance. General and administrative expenses represent costs unrelated to property operations or transaction costs. These expenses include, but are not limited to, payroll and benefits, professional services, office expenses and depreciation of corporate assets. 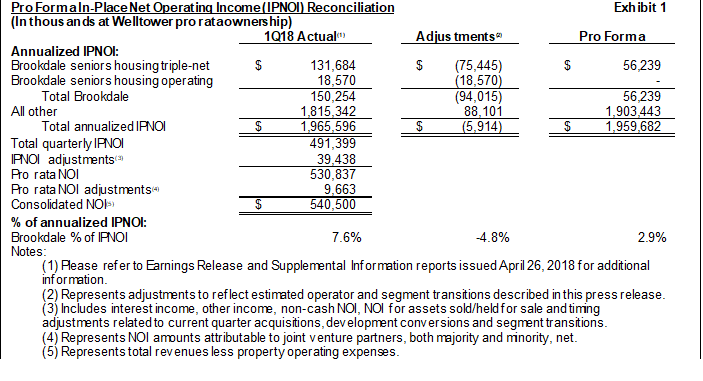 IPNOI represents NOI excluding interest income, other income and non-IPNOI and adjusted for timing of current quarter portfolio changes such as acquisitions, development conversions, segment transitions, dispositions and investments held for sale. Welltower’s supplemental reporting measures and similarly entitled financial measures are widely used by investors, equity and debt analysts and ratings agencies in the valuation, comparison, rating and investment recommendations of companies. Welltower’s management uses these financial measures to facilitate internal and external comparisons to historical operating results and in making operating decisions. Additionally, these measures are utilized by the Board of Directors to evaluate management. None of the supplemental reporting measures represent net income or cash flow provided from operating activities as determined in accordance with U.S. GAAP and should not be considered as alternative measures of profitability or liquidity. Finally, the supplemental reporting measures, as defined by Welltower, may not be comparable to similarly entitled items reported by other real estate investment trusts or other companies. This press release contains “forward-looking statements” as defined in the Private Securities Litigation Reform Act of 1995. When we use words such as “may,” “will,” “intend,” “should,” “believe,” “expect,” “anticipate,” “project,” “pro forma,” “estimate” or similar expressions that do not relate solely to historical matters, we are making forward-looking statements. In particular, these forward-looking statements include, but are not limited to, those relating to our ability to complete the Brookdale restructuring on expected terms and within the expected timeframe; opportunities to acquire, develop or sell properties; our ability to close anticipated acquisitions, investments or dispositions on currently anticipated terms, or within currently anticipated timeframes; the expected performance of our operators/tenants and properties; our expected occupancy rates; our ability to declare and to make distributions to shareholders; our investment and financing opportunities and plans; our continued qualification as a REIT; our ability to access capital markets or other sources of funds; and our ability to meet our earnings guidance. Forward-looking statements are not guarantees of future performance and involve risks and uncertainties that may cause our actual results to differ materially from our expectations discussed in the forward-looking statements. This may be a result of various factors, including, but not limited to: the status of the economy; the status of capital markets, including availability and cost of capital; issues facing the health care industry, including compliance with, and changes to, regulations and payment policies, responding to government investigations and punitive settlements and operators’/tenants’ difficulty in cost-effectively obtaining and maintaining adequate liability and other insurance; changes in financing terms; competition within the health care and seniors housing industries; negative developments in the operating results or financial condition of operators/tenants, including, but not limited to, their ability to pay rent and repay loans; our ability to transition or sell properties with profitable results; the failure to make new investments or acquisitions as and when anticipated; natural disasters and other acts of God affecting our properties; our ability to re-¬lease space at similar rates as vacancies occur; our ability to timely reinvest sale proceeds at similar rates to assets sold; operator/tenant or joint venture partner bankruptcies or insolvencies; the cooperation of joint venture partners; government regulations affecting Medicare and Medicaid reimbursement rates and operational requirements; liability or contract claims by or against operators/tenants; unanticipated difficulties and/or expenditures relating to future investments or acquisitions; environmental laws affecting our properties; changes in rules or practices governing our financial reporting; the movement of U.S. and foreign currency exchange rates; our ability to maintain our qualification as a REIT; key management personnel recruitment and retention; and other risks described in our reports filed from time to time with the Securities and Exchange Commission. Finally, we undertake no obligation to update or revise publicly any forward-looking statements, whether because of new information, future events or otherwise, or to update the reasons why actual results could differ from those projected in any forward-looking statements.